DOES: learn about different instruments using colors, shapes, reading, touch, hearing- it's multi-sensory! Poor kids. Part of me does feel really bad. I know I'm being too sensitive. It's so bad that now I barely listen to any music at all. I don't think it's possible to put all of the instruments in the "orchestra pit." But, Number 2 does try. 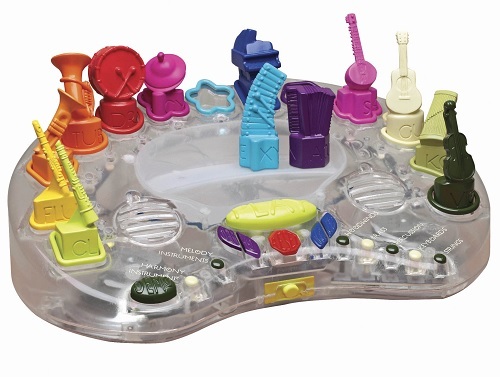 However, despite my fear of "toys with noise", I loved the whole idea of B. Symphony, a toy that allows your child to vary the instruments being played in a song WHILE the song is still playing! That was just so cool! You just take an instrument, place it in the "orchestra pit" and it just starts playing that particular instrument's part of the song. I just had to try it! And we are so lucky because this toy proved to my fragile ears that children and open-ended music making can be delightful and pleasant! Reasons to Love Me,...Oops, I Mean B. 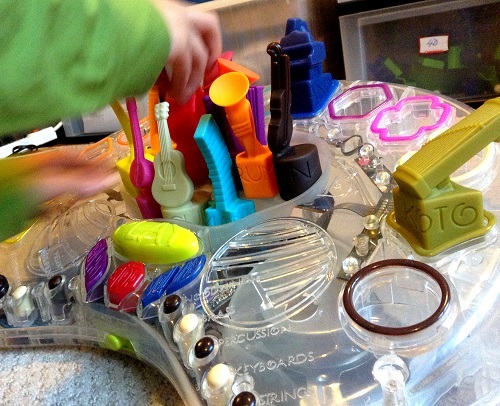 After the novelty of this very unique toy wears down, your child might start feeling that piling on all the instruments onto the "orchestra pit" will no longer thrill him. Then hopefully they'll do what you really want them to do: stop and listen and learn what kind of sound each instrument makes. The bonus gift is that you can do this for each of the 13 instruments in your listening exploration for 15 songs. Many of them are kid favorites like Twinkle Twinkle Little Star but B. 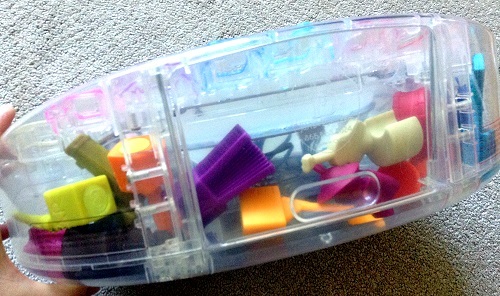 Toys also manage to mix in works like Beethoven's Fifth Symphony, Come Little Leaves, and Für Elise. I consider that a gift to me. It's really soothing to my sensitive ears. This is an obvious plus. I love when I am in my bedroom and my son has walked away and I start to wonder if he is doing something productive. Then suddenly I hear him mixing up a new way to listen to his favorite song and that really pleases me. The B. Symphony doesn't record but I do feel like it's so easy for him to experiment. There are buttons to change tempo, songs, and buttons to show you which are the woodwinds, strings, etc..
Press buttons to see which instruments offer harmony for a particular song. In the same way, you can identify the melody, the woodwinds, percussion and more.. There is volume control too but for me, as long as we set it to low volume with just a few instruments I am fine. No tape necessary. Phew!!! Seriously, I have hidden some of the noisy toys in my house because I am so sensitive but B. Symphony actually remains in the middle of our living room to encourage spontaneity. This is really a big step for me. You have no idea. The kids can see everything! I love that! This is the first toy for preschoolers that I can remember where the plastic is completely see through! That is so awesome. 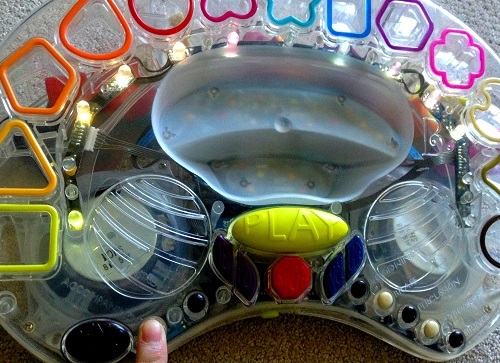 It's not that I expect kids to understand complex circuitry but everytime the kids play with it, they'll see it. It's there. 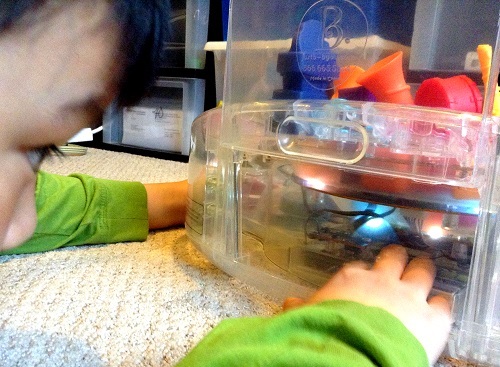 Things like up, they see there are wires connected to something else and know that sounds come out of somewhere else and I love that any child can look and learn all on his own. I think this is such a high point! When the kids get older and it is time to pass it on, I will challenge them to take it apart and see how it works. If they do it now, I'll be really mad but when they are older, I'll be thrilled that they be able to really figure out how this works. 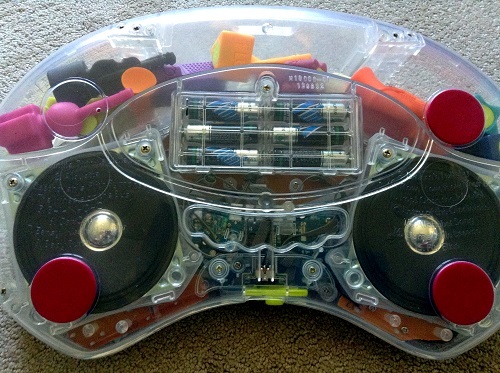 I should note however that I think the clear plastic element is a B. thing. Apparently all of their clear plastic toys are recyclable and marked #1. I think that means our sanitation systems should take it. Who knew? Really great design can b. earth-friendly. B. Symphony offers storage but I think you have to dedicate a space within easy reach if you desire spontaneous musical combustion. I love how your child must pick up the instrument he or she wants and then place it on the orchestra pit. For a very young child, this is much more involved than say... pressing a button. I also love how it responds automatically when you remove the instrument from the pit. Additionally, it's admirable how a child who may not be able to read words or remember what something is called can still identify or associate the instruments with either colors or shapes. It's very thoughtful. 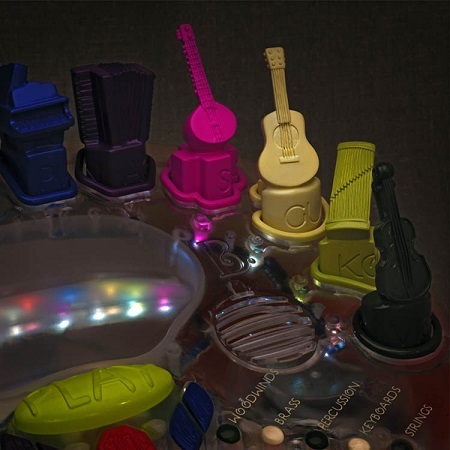 I know it could also be a shape sorter but I see these shapes and colors to be very helpful for people like me who can't think of a word right away but would always remember that the guitar is a creme-colored crescent. 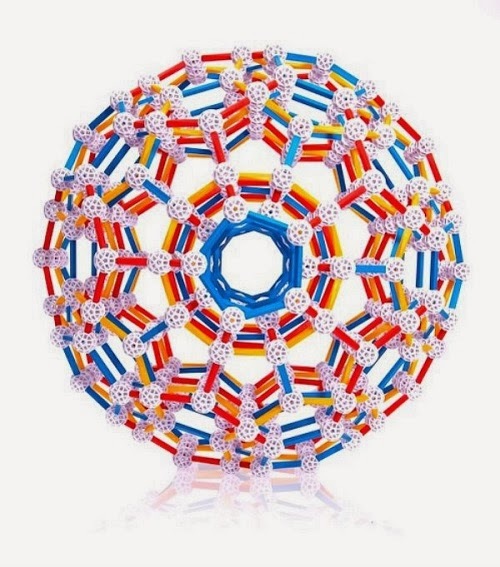 This is one of the toys that would go into a future Gifts by Grandparents list for this holiday season but as a clear toy with cheerfully dramatic colors, I can definitely feel a summer vibe as well. Before deciding, make sure you watch the video! 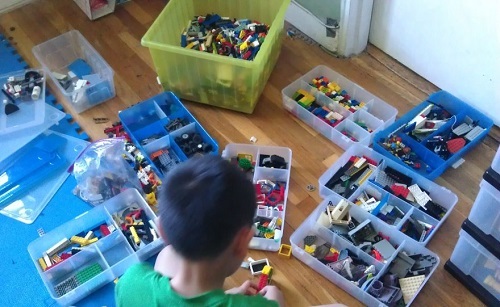 If you like what I said, you'll love my kid did does with his B. Symphony. Want to see something really amazing? Check out SoundStage by Brett Paine Murphy here. Are you an Amazonian Primate? Use my link to support Toys are Tools but remember the MSRP is $49.99. If it's more than that, you may want to just go elsewhere. But thanks for wanting to support me anyway. Disclosure: Toys are Tools was not compensated by the manufacturer for the publication of this review. 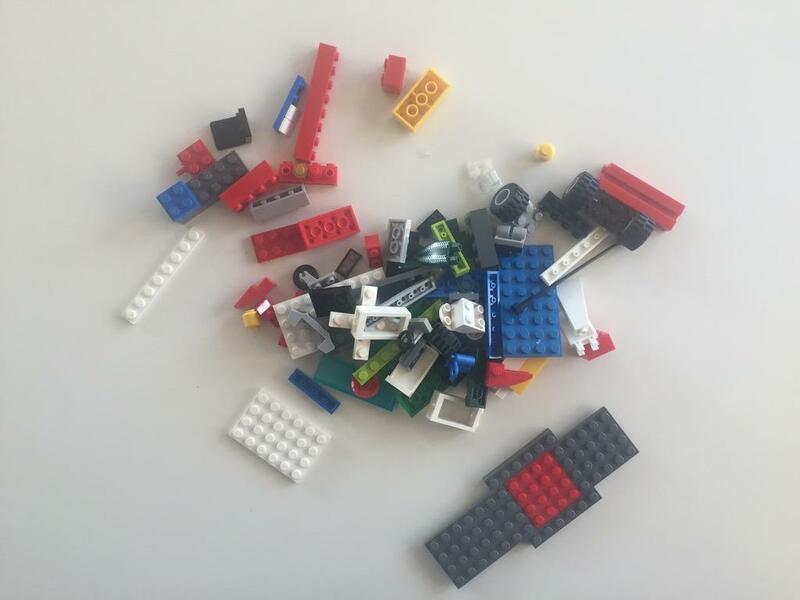 The toy was provided to Toys are Tools to facilitate a review. Reviews are never promised.